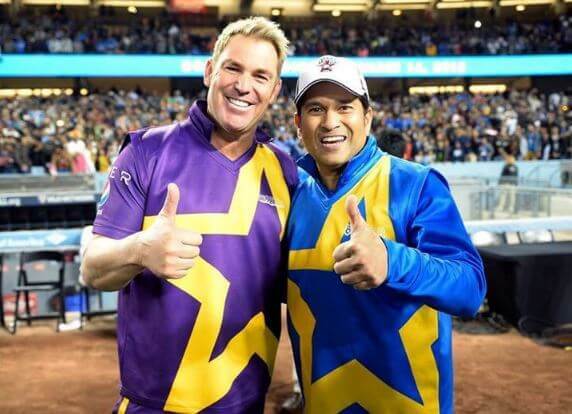 Cricketing legends Sachin Tendulkar and Shane Warne, in 2015, had come up with a unique idea to promote cricket around the world. They had chosen the United States to organise a league called Cricket All Stars. The 2 former cricketers led the 2 teams in a 3-T20 series. Several former cricketing stars like Virender Sehwag, Ricky Ponting, Courtley Ambrose, Jacques Kallis, Glenn McGrath, Sourav Ganguly, Brian Lara had flown to the US to participate in the league. The matches weren’t played on regular cricket grounds. Three Baseball grounds in New York, Houston and Los Angeles had hosted the matches with drop-in pitches. Sachin’s team was named as the Blasters while Warne’s team was Warriors. Shane Warne’s Warriors had won all the 3 matches of the league. But the results weren’t the concerns. They wanted to promote the game and had done a great job at that. The crowd turnout in the stadiums was proof of that. Will the United States host another season of Cricket All Stars? The Cricket All Stars league was expected to take place again. But unfortunately, it’s not going to happen. Shane Warne, in his autobiography, “No Spin”, had cited differences in opinion between him and Sachin as the reason for the league not to take place again. “I said, ‘Well it’s my idea. I know I can get the best players and I am prepared to go 50-50 with you. I suggest we pay experienced people to organise it and appoint two from each of our camps’. “I was uneasy with that but remained sure Sachin and I together would make it work, so I agreed. At the next meeting, he brought a couple of other guys along who seemed efficient and on the ball. Warne admitted that the organisation of the Cricket All Stars League wasn’t up to the mark. He mentioned that ground deals weren’t done well and they left things too late. “The organisation was not as it could, or should, have been, which was a real shame. They were decent guys but the event got too big for them,” Warne wrote about Tendulkar’s team. “The truth is, if you ask me, that they didn’t do the pitch/ground deal quite right and fell foul of that old line of the devil being in the detail of the contract. This, along with other small and important aspect of a top level event… was all very last minute and not slick as I had wanted. Also, Warne wrote that Sachin Tendulkar had asked specifically his people to take care of the league. “Sachin got onto a guy called Raj, who, strangely, I knew a bit from poker and he came in at the very last moment, saving the day with his organizational skills and, most importantly, paying a heap of outstanding bills that helped us to go ahead,” Warne added. “When we eventually met for a debrief, the first thing I said to Sachin was that size of the events overwhelmed a couple of his guys, Sanjay in particular and that we’d be better employing others for event management. He took offence at that, which was fair enough. “At the very least I said, let’s go with the two and two idea I had at the beginning. Warne further mentioned that the difference between him Sachin had grown. Sadly, the famous Cricket All Stars league went into the dark and never happened because of that. “One of the players told me he was actually signing with Sachin, which caught me off guard. I said, “that’s cool, he has the right to do exactly as he wants as do you. But it can’t be under the All Stars banner – that’s mine,” Warne further wrote.